I am so sick of being addressed as "My Friends". 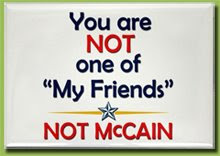 you are not one of "My Friends". So... Obama is to blame? Using 9/11 images for politcal gain, or worse?